1. Cardio is a Huge Factor.2. Strength is Important.3. It is Intense.4. Make it Through Week 1.5. You Will Love It. Well, its official, I am done the first 4 weeks of Insanity and I am now in recovery week. I missed a few workouts here and there (at most only 1 a week) but that is sufficient enough to say I completed it! So here is what I thought of the first month (And recovery week). I’m officially committed. 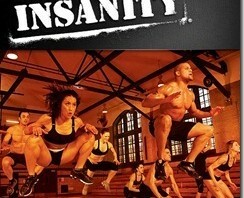 After the half marathon on the 17th, I’m going to start the Insanity program. There will be no running, no Zumba, no weight lifting. Just pure Insanity. Can’t you hear the excitement? LoL! Continue reading Insanity, Here I Come!